3 miles on the schedule. A little rainy but done nevertheless. It's pretty accurate too. The times are accurate but some of my standings are a little off. There were only two races I could not pull up on this that I ran. 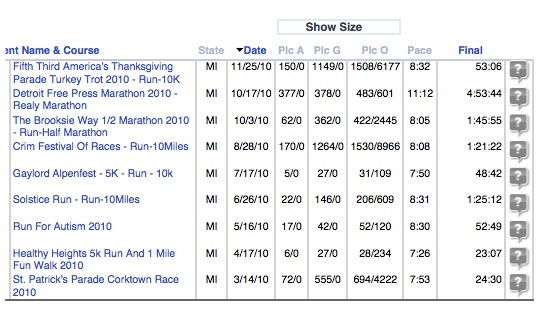 One was a really small race with only about 50 people in it in a small town up north Michigan. 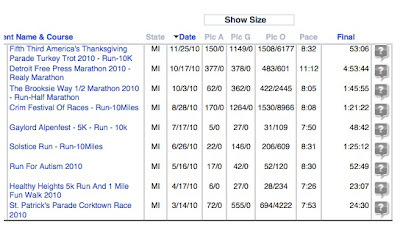 The second one was a virtual 11k for the National Veterans Day race. 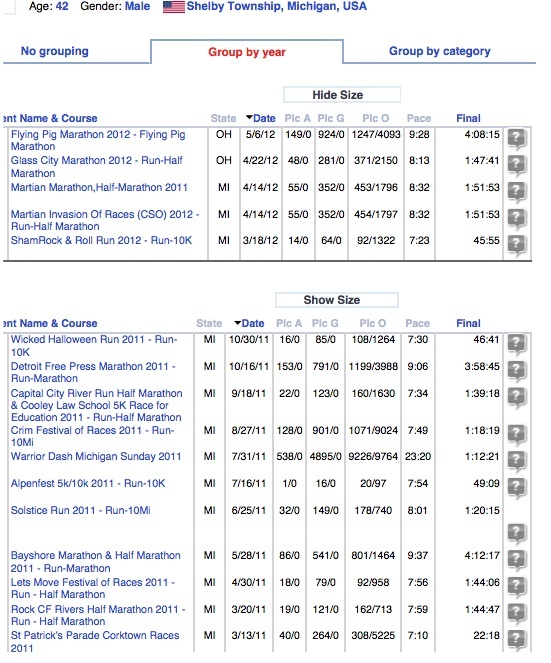 Other than that, you can see every race I have done. A great way to track all your races. Try it out. All you have to do is put in your name and you can put your State in and there you have it - races you ran! If they are in another State, you will have to look for it but can then claim it. They say that once you claim enough, it should start showing up on your results without having to find them as long as you have the same information for the race. I like Athlinks. You can friend me too. Occasionally, they have been slow with some results, but it is the best results site overall. Like Coach Ken mentioned, I too use it to check on the competition. 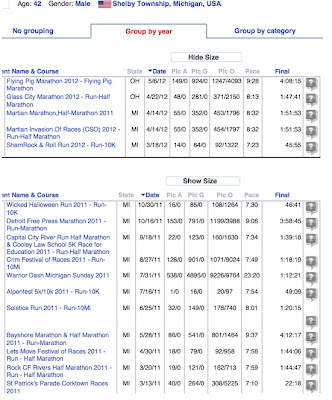 I'll look at last year's results of a race I am planning to do so I know what to expect. Can I place in my age group? I can usually get a good idea. My two most recent results aren't there, but it is not Athlinks' fault, they just haven't been published online. That's ok - the competition won't be aware of my increased speed. :P I do want them up there eventually to see if my RPI or whatever it is called drops. I am a big fan of athlinks. Makes it easy to check out stats and whatnot. So far it has done a good job at claiming my results automatically, which is convenient.